The history of Libya as an Italian colony began in the 1910s and lasted until February 1947, when Italy officially lost all the colonies of the former Italian Empire. It can be divided in two periods: the first from 1911 to 1934 called "Italian colonization" and the second from 1934 called "Italian Libya" (after the creation of "Libya" as a political entity). The Italian colonization of Libya started in 1910. On 3 October 1911, Italy attacked Tripoli, claiming to be liberating the Ottoman Wilayats from Istanbul's rule. 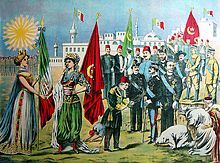 Despite a major revolt by the Arabs, the Ottoman sultan ceded Libya to the Italians by signing the 1912 Treaty of Lausanne (not to be confused with a more famous treaty of the same name made in 1923). 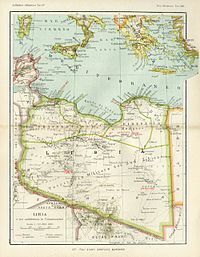 Tripoli was largely under Italian control by 1914, but both Cyrenaica and the Fezzan were home to rebellions led by the Senussi. Italo Balbo, Governor of Italian Libya 1934–1940, promoted the colonization of Libya by Italians. The conquest was also done using colonial troops who fought with cruelty like in the 1911 Tripoli massacre: between 1911 and 1912, over 1,000 Somalis from Mogadishu, the then capital of Italian Somaliland served as combat units along with Eritrean and Italian soldiers in the war. Most of the troops stationed never returned home until they were transferred back to Italian Somaliland in preparation for the invasion of Ethiopia in 1935. On 25 October 1920, the Italian government recognized Sheikh Sidi Idris as the hereditary head of the nomadic Senussi, with wide authority in Kufra and other oases, as Emir of Cyrenaica, a new title extended by the British at the close of World War I. The Emir would eventually become King of the free Libyan state after World War II. The Italians made extensive use of the Savari, colonial cavalry troops raised in December 1912: these units were recruited from the Arab-Berber population of Libya following the initial Italian occupation in 1911–1912. The Savari, like the Spahi or mounted Libyan police, formed part of the Regio Corpo Truppe Coloniali della Libia (Royal Corps of Libyan Colonial Troops). Several reorganizations of the colonial authority were made necessary, in the face of armed Arab opposition, mainly in Cyrenaica. From 1919 (17 May) to 1929 (24 January), the Italian government maintained the two traditional provinces, with separate colonial administrations. A system of controlled local assemblies with limited local authority was set up, but was revoked on 9 March 1927. In 1929, Tripoli and Cyrenaica were united as one colonial province. Then in 1934, as Italy wanted to achieve imperial status, the classical name "Libya" was revived as the official name of the colony. The newly created "Libya" was then split administratively into four provinces, Tripoli, Misrata, Benghazi, and Derna. The Fezzan area was called Territorio Sahara Libico and administered militarily. 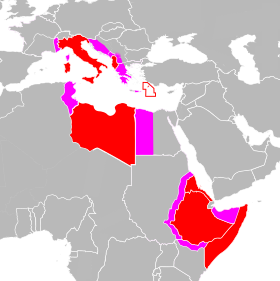 The Italian colonization of the Ottoman provinces of Tripolitania and Cyrenaica was not initially successful and it was not until the early 1930s that the Kingdom of Italy took full control of the area. The Italian governor Marshal of the Air Force Italo Balbo promoted the birth of the modern state of "Libya", and until 1940 favoured the integration of Italian emigrants to Libya with the Arab population. He is considered by some Italian historians (such as G. Gentile) to be the Father of modern Libya. Fighting intensified after the accession to power in Italy of the dictator Benito Mussolini. The Emir Muhammad Idris fled to Egypt in 1922. From 1931 to 1932, Italian forces under General Badoglio waged a punitive pacification campaign. Badoglio's successor in the field, General Rodolfo Graziani, accepted the commission from Mussolini on the condition that he was allowed to crush Libyan resistance unencumbered by the restraints of either Italian or international law. Mussolini reportedly agreed immediately and Graziani intensified the oppression. Some Libyans continued to defend themselves, with the strongest voices of dissent coming from the Cyrenaica. Omar Mukhtar, a Senussi sheikh, became the leader of the uprising. After a much-disputed truce, the Italian policy in Libya reached the level of full-scale war. A barbed wire fence was built from the Mediterranean to the oasis of Jaghbub to sever lines critical to the resistance. Soon afterwards, the colonial administration began the wholesale deportation of the people of the Jebel Akhdar to deny the resistance the support of the local population. The forced migration of more than 100,000 people ended in concentration camps in Suluq and El Agheila, where thousands died in squalid conditions. It is estimated by Arab historians that the number of Libyans who died, killed in the fighting or through starvation and disease is a minimum of 80,000 people, up to one third of the Cyrenaican population. Fascist historian Giovanni Gentile claimed that this amount was excessive, and only a few thousands died, mainly of disease (even related to the Spanish flu epidemic and consequences) and starvation. After Al-Mukhtar's capture September 15, 1931 and his execution in Benghazi, the resistance petered out. Limited resistance to the Italian occupation crystallized round the person of Sheik Idris, the Emir of Cyrenaica. By 1934, Libya was fully pacified and the new Italian governor Italo Balbo started a policy of integration between the Libyans and the Italians, that proved fully successful. In summer of this year he created the new political entity called Italian Libya. In March 1937 Mussolini made a state visit to Libya, where he opened a new military highway running the entire length of the colony (the Via Balbia). For propaganda reasons he had himself declared Protector of Islam and was presented with a symbolic sword. Mussolini's publicized encouragement of the Arab nationalist movement suited his wider policies of confronting Britain and France. He also sought to fully colonise Libya, introducing 30,000 Italian colonists which brought their numbers to more than 100,000. These colonists were shipped primarily to Sahel al-Jefara in Tripolitania and the Jebel Akhdar in Cyrenaica, and given land from which the indigenous inhabitants had been partially removed during the colonial war in the 1920s. In 1939, laws were passed that allowed Muslims to be permitted to join the National Fascist Party and in particular the Muslim Association of the Lictor (Associazione Musulmana del Littorio), and the 1939 reforms allowed the creation of Libyan military units within the Italian army. As a consequence during the Second World War, there was strong support for Italy between many Libyans, who enrolled in the Italian Army (other Libyan troops were fighting for the Kingdom of Italy since the 1920s: the Savari (cavalry regiments) and the mounted police called Spahi). Indeed, two divisions of Libyan colonial troops (with 30000 native Muslim soldiers) were created (and in summer 1940 the first and second Divisions of Fanteria Libica -Libyan infantry - participated in the Italian offensive against British army in Egypt ): 1 Libyan Division Sibelle and 2 Libyan Division Pescatori. The Kingdom of Italy built in Libya nearly 400 km of railways with 950 mm gauge. Since 1912 were imported to Tripoli new trains for some railways being built around Italian Tripoli. The last line the Italians started to create was the Tripoli-Benghazi (of 1040 km with 1435 mm gauge) in summer 1941, but their defeat in World War II stopped it at the beginning. On 13 September 1940, Mussolini's highway was used for the invasion of Egypt by Italian forces stationed in Libya. Two divisions of Libyan colonial troops (for a total of 30090 native Muslim soldiers) participated in the offensive. Even a battalion of Libyan paratroopers was raised shortly before World War II, the first force of this kind to be created in all Africa. This showed how successful was the process of colonization in Italian Libya. Under the terms of the 1947 peace treaty with the Allies, Italy, which hoped to maintain the colony of Tripolitania, (and France, which wanted the Fezzan), relinquished all claims to Libya. Libya so remained united. In July 1998, the Italian government offered a formal apology to Libya. In August 2008 the two nations signed a treaty of friendship in which US$5 billion in goods and services, including the construction of the Libyan portion of the Cairo-Tunis highway, would be given to Libya to end any remaining animosity. The Italians in less than thirty years (1911–1941) built huge public works, allowing the Libyan economy to flourish to a level unseen since the time of the Roman Empire, though these developments mostly benefitted Italy and Italian settlers. For propaganda purposes, Mussolini also sponsored archaeological projects focusing on Roman settlements. Leptis Magna was rediscovered in the 1920s and viewed as a symbol of the Italian right to colonize the region, after the capture of the Libyan Desert. Libya was considered the new "America" for Italian emigrants in the Thirties. The Italian population numbered 108,419 (12.37% of the total population) at the time of the 1939 census, concentrated on the coast around the city of Tripoli (37% of the city's population) and Benghazi (31%). In 1938, Marshal of the Air Force Italo Balbo, the Governor, brought 20,000 Italian farmers to colonize Libya, and 26 new villages were founded by them, mainly in Cyrenaica (like "Villaggio Oberdan"). The 22,000 Libyan Jews were allowed to integrate without problems in the society of the Fourth Shore (but after summer 1941, with the arrival of the German Afrika Korps, they started to be moved to temporary internment camps in Libya under Nazi SS control). On January 9, 1939, the colony was incorporated into metropolitan Italy and thereafter considered an integral part of the Italian state. By 1939, the Italians had built 400 km of new railroads and 4,000 km of new roads (the most important and largest was the one from Tripoli to Tobruk, named Via Balbia). Even during World War II a new road was being built, the Via della Vittoria, and a new Tripoli-Benghazi railway. All the Italian projects disappeared after the Italian defeat: Libya in the late forties experienced the beginning of the worldwide process of decolonization that characterized colonies of Europe in the Fifties and Sixties. ^ William James Makin. War Over Ethiopia. p. 227. ^ Helen Chapin Metz wrote in her book Libya: A Country Study: Once pacification had been accomplished, fascist Italy endeavoured to convert Libya into an Italian province to be referred to popularly as Italy's Fourth Shore. In 1934 Tripolitania and Cyrenaica were divided into four provinces—Tripoli, Misrata, Benghazi, and Darnah—which were formally linked as a single colony known as Libya, thus officially resurrecting the name that Diocletian had applied nearly 1,500 years earlier. Fezzan, designated as South Tripolitania, remained a military territory. A governor general, called the first consul after 1937, was in overall direction of the colony, assisted by the General Consultative Council, on which Arabs were represented. Traditional tribal councils, formerly sanctioned by the Italian administration, were abolished, and all local officials were thereafter appointed by the governor general. Administrative posts at all levels were held by Italians.An accord with Britain and Egypt obtained the transfer of a corner of the Anglo-Egyptian Sudan, known as the Sarra Triangle, to Italian control in 1934. The next year, a French-Italian agreement was negotiated that relocated the 1,000-kilometer border between Libya and Chad southward about 100 kilometers across the Aouzou Strip, but this territorial concession to Italy was never ratified by the French legislature. In 1939 Libya was incorporated into metropolitan Italy. During the 1930s, impressive strides were made in improving the country's economic and transportation infrastructure. Italy invested capital and technology in public works projects, extension and modernization of cities, highway and railroad construction, expanded port facilities, and irrigation, but these measures were introduced to benefit the Italian-controlled modern sector of the economy. Italian development policy after World War I had called for capital-intensive "economic colonization" intended to promote the maximum exploitation of the resources available. One of the initial Italian objectives in Libya, however, had been the relief of overpopulation and unemployment in Italy through emigration to the undeveloped colony. With security established, systematic "demographic colonization" was encouraged by Mussolini's government. A project initiated by Libya's governor, Italo Balbo, brought the first 20,000 settlers--the ventimilli--to Libya in a single convoy in October 1938. More settlers followed in 1939, and by 1940 there were approximately 110,000 Italians in Libya, constituting about 12 percent of the total population. Plans envisioned an Italian colony of 500,000 settlers by the 1960s. Libya's best land was allocated to the settlers to be brought under productive cultivation, primarily in olive groves. Settlement was directed by a state corporation, the Libyan Colonization Society, which undertook land reclamation and the building of model villages and offered a grubstake and credit facilities to the settlers it had sponsored. The Italians made modern medical care available for the first time in Libya, improved sanitary conditions in the towns, and undertook to replenish the herds and flocks that had been depleted during the war. But, although Mussolini liked to refer to the Libyans as "Muslim Italians," little more was accomplished that directly improved the living standards of the Arab population. Tuccimei, Ercole. La Banca d'Italia in Africa, Foreword by Arnaldo Mauri, Editori Laterza, Bari, 1999. ISBN 88-420-5686-3. This page was last edited on 26 March 2019, at 15:30 (UTC).